Giovanna Ambrusco’s new book “Finding My Voice” is an evocative book on the author’s personal account as she dares to follow her instincts in a new country. 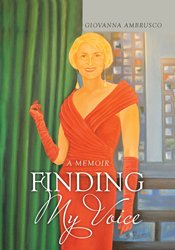 Recent release “Finding My Voice” from Page Publishing author Giovanna Ambrusco is a powerful book that tells the story of the author as a young naïve woman from a small town in Italy who has moved in America to achieve her dreams and find her voice, experiencing a more fulfilling life. Giovanna Ambrusco, a passionate dream-chaser, has completed her new book “Finding My Voice”: an encouraging and inspiring book on the author’s personal testimony featured through an interview that takes into account the challenges she has faced in her journey of following her passions in America. Published by New York City-based Page Publishing, Giovanna Ambrusco’s heartwarming book on a woman’s uphill journey to a lifelong series of achievements. Ambrusco is a determined and passionate person, and these traits are clearly shown in her book. Readers who wish to experience this beautifully written work can purchase“Finding My Voice” at bookstores everywhere, or online at the Apple iTunes store, Amazon, Google Play, Kobo or Barnes and Noble.